Procter & Gamble and Automatic Data Processing have seen a lot of press coverage recently as two of the largest companies to ever face proxy contests for board seats. P&G is the largest target ever, with a market value of $223 billion, and ADP is number 12, at $50 billion. Trian Fund’s proxy contest for one board seat at P&G, in an attempt to address weak shareholder returns and deteriorating market share, was defeated at the October 10 annual meeting, based on preliminary voting results. ADP’s annual meeting will take place on November 7, where Pershing Square is seeking three board seats as a step towards increasing operational efficiency at the company. In addition to the size of the targets, P&G and ADP are also two of the costliest fights on record. When looking at combined estimated costs related to proxy fights, P&G is by far the most expensive on record, with costs reaching an astounding $60 million. This is almost double the expected costs of the recently settled fight at Arconic Inc., where Elliott Management was granted three seats after campaigning against the company’s poor operational and financial results and corporate governance. ADP and Pershing Square’s combined costs of $26 million is the fourth highest on record; however, the $24 million disclosed by the company is the second highest single cost (just behind P&G’s $35 million). One would expect the largest activists seeking seats at the largest companies to result in the highest costs, but P&G’s historic total also highlights the importance of its retail ownership component. Based on FactSet Ownership data from the last 10 years, the average institutional ownership as a percentage of public float is roughly 90% in SharkWatch 50 (a compilation of the 50 most significant activist investors as chosen by FactSet) proxy fight targets with over $1 billion in market cap. P&G’s institutional ownership of 62% is not only well below the average, it is the lowest percentage of any company on the list. With potentially 40% of the voting shares held by retail holders, the solicitation of these votes was both necessary and costly. Higher costs appear to be here to stay. Four of the top six combined costs involved 2017 annual meetings: the aforementioned P&G, ADP, and Arconic, as well as General Motors, which made it all the way to a vote in June with GM defeating Greenlight Capital’s attempt at board seats and an unorthodox dual-class structure. 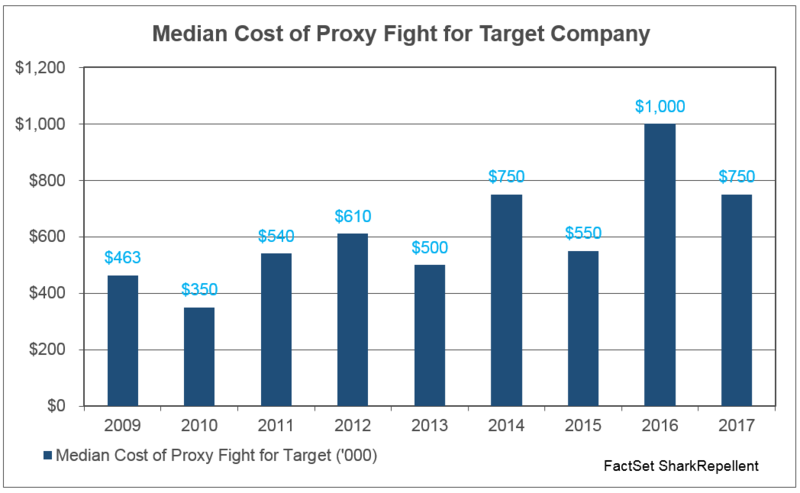 Furthermore, the median cost for all proxy fights with disclosure in 2017 is $750,000, tied for the second highest total since we started collecting this data; 2016 was the highest, with a median cost of $1 million. 2015 saw a record number of high-impact activism campaigns announced, making 2016 a busy year for proxy fight meetings. In 2016, there were 101 proxy fights for board seats, the highest level since 2009, and 50 proxy fights formally settled, the highest ever. In 2017, however, overall proxy fights and proxy fights for board seats are both at five-year lows, at 82 and 75 campaigns, respectively. Year-to-date “high impact” campaigns seem to indicate that overall activism volume is in line with recent years, so we decided to take a closer look at potential drivers behind the decrease in fights specifically. One explanation that stands out is a decline in activity from the largest activist hedge funds. The SharkWatch 50 has historically been responsible for roughly 40% of all proxy fights in the U.S. Proxy fight campaigns by these established activist hedge funds have decreased over the last two years. So far, in 2017, there have been 36 proxy fights by SharkWatch 50 members, also a five-year low and the second lowest in the last 10 years. Additionally, it appears more activists are targeting the removal of key executives before launching a proxy contest. 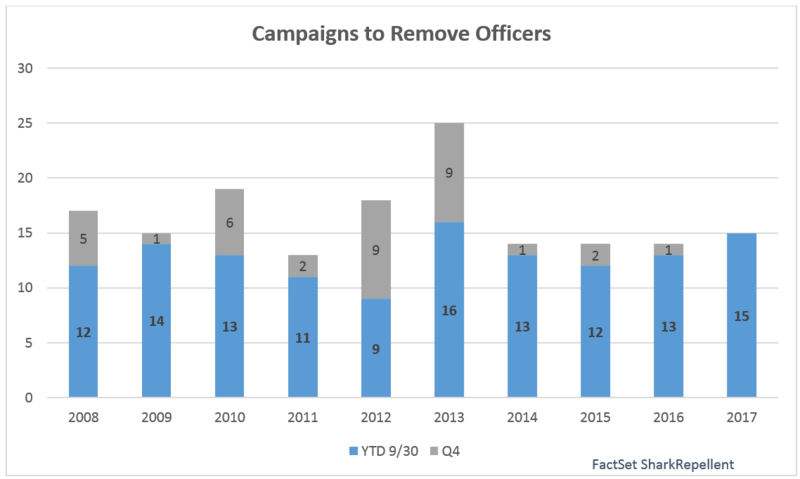 From looking at all campaigns with a public demand for executive removal, the 15 campaigns announced in 2017 is already the highest full year total since 2013. If we consider only campaigns announced through September 30, that total is the second highest all-time behind 2013. So far, only four of this year’s campaigns have involved a proxy fight. Lastly, the upward trend of settlements has continued in 2017. 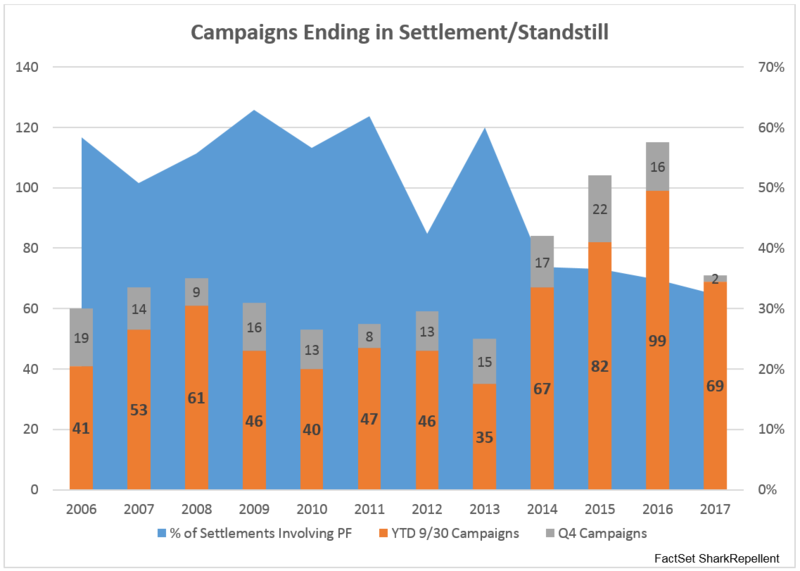 The 69 campaigns that ended with a settlement or standstill as of September 30 was the third highest total in that timeframe, behind 2016 and 2015. When considering the low volume of fights this year, the settlement trend is even more telling. The percentage of settlements or standstills that involved a proxy fight this year is down to 32%, the lowest ever. A testament to the changing environment, the five-year average leading up to 2010 was 57% of settlements/standstills. Interestingly, management’s willingness to settle has occurred simultaneously with an increase in management win percentage for fights that have gone the distance. In 2016, management won 74% of the fights that went to a vote, increasing from 52% in 2015 and 38% in 2014. To date, the win rate for 2017 fights is about 50/50, but with over 10 proxy fights pending, a lot can change before the end of the year. We will include updated win and settlement percentages in our 2017 year-end review. Mike joined FactSet in 2015 and is based in New York.